I always wonder what the original inspiration, flavor combination, or most basic and unadulterated version of a popular dish must be like. I try to make it the most natural or logical or basic way, then compare that to the modern shortcut that typically achieves cult status but is but a shadow of the original… Buko Pandan desserts in Filipino eateries and restaurants are extremely popular these days, and I rarely if ever saw this as a child. So it’s a last 20-30 year phenomena, and I wanted to see what the fuss was about. I understand why people take shortcuts, it’s convenient and I do it myself sometimes, but I also wanted to see just how difficult it was to do it basically from scratch, or near scratch, and see if there was a noticeable difference in taste and quality. So first, I purchased unflavored gelatin and made my own pandan infused water from four leaves of pandan (screwpine) from the garden. I simply cut up the pandan, added it to 3 cups of water and let it come to a boil. A minute or two later, I turned off the flames, and let the leaves infuse the water with their flavor, a rather strong, almost medicinal aroma fills your kitchen. Some folks might find the aroma a bit of a turn off, but many others find it appealing. Following the manufacturers instructions for the jelly, I added slightly less pandan water than called for to make a firm jelly. Notice the almost near absence of green color. You cannot imagine just how MUCH green food coloring is put into the instant pandan flavored gelatins in the grocery. A phenomenal amount of food coloring, and probably artificial flavoring as well. 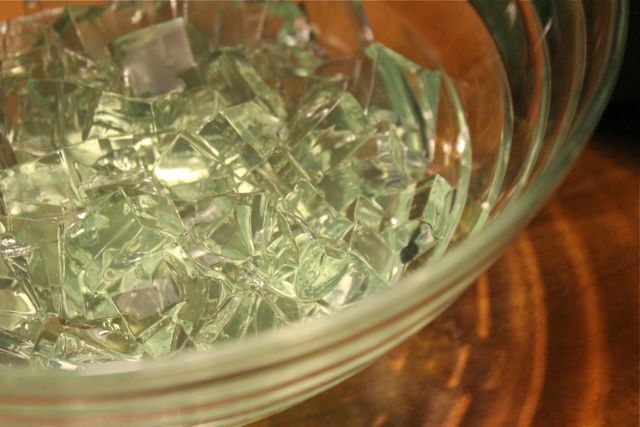 If you must have a tinge or more of green, then add just a single drop of green food coloring to each package of gelatin. Let this set in the fridge for say half an hour until solid. Cut into cubes and place in a bowl. I LOVED the near sea-glass green of this jelly. It was extremely subtle in color and yet sufficiently aromatic and tasty… not an intensely faked out pandan flavor that one gets used to using pre-flavored gelatins. 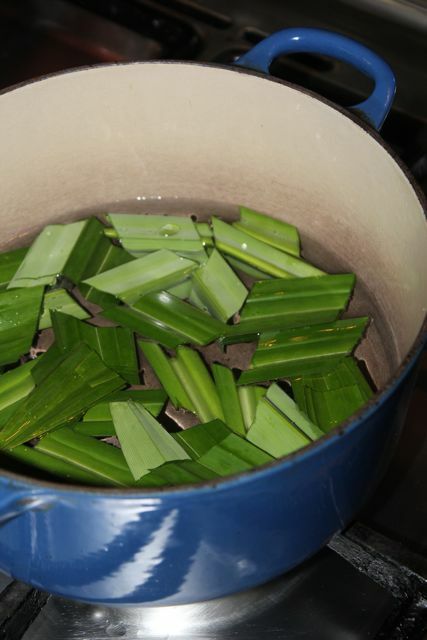 Add more pandan leaves or leave them in the water longer if you prefer a stronger pandan flavor. I liked the subtle approach. 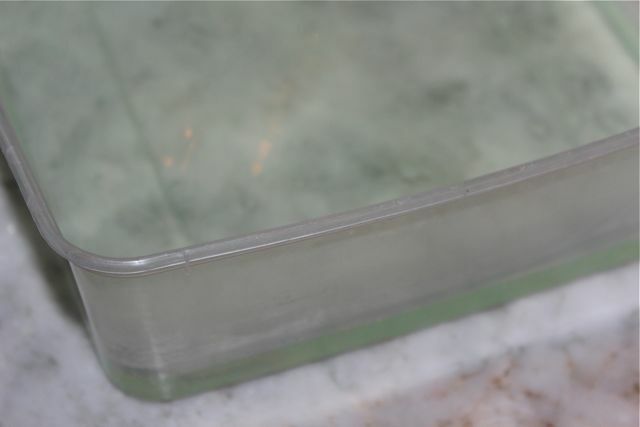 The the gelatin cubes I added about 4 ounces or half a small bottle worth of homemade macapuno preserves, some milk and heavy cream and no more sugar or condensed milk. Chill well before serving. This was wonderful. The macapuno took the place of buko and sugar but added that distinct flavor of the odd nut. The dessert was still sweet, yet creamy and uplifting, not heavy. A home run. And something I hope to put in our restaurants if I can make enough macapuno preserves. It honestly wasn’t much harder to make than using the boxed pandan gelatine, and yet it resulted in something much more obviously natural and homemade. Delicious. I have made the instant version before, see this previous post. As they say the “walang kamatayan” buko pandan dessert…. I make my pandan flavored gelatin from scratch too – pandan leaves from the garden… If using local gelatin, there is also a green unflavored gelatine… Will try the macapuno preserves next time… I only use buko and the usual nestle cream and condensed milk …I add small sago too ..sometimes I add lychees …refreshing dessert! i blitz the pandan and water in a blender first so i get a more pronounced color and flavor. must strain with a fine sieve though. try making the gelatin by replacing water with buko juice…… champion yummo! I have loved the pandan buko confection on visits to Manila. How much yummier your home made version must be! Wish more people would go back to basics like you and your readers do, MM. Like the shagreen background, by the way. P.S. Did you mean to type ”phenomenon” in the first paragraph? 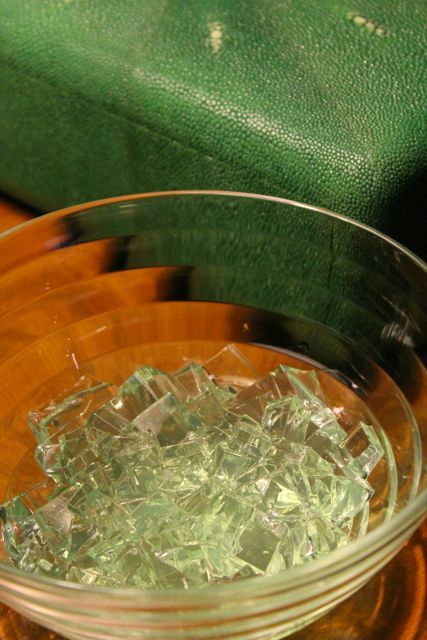 and that green shagreen box beside it just sets the greenness – great setting! Connie, fascinating and extremely disturbing article. I have featured ivory pieces before, here, here and here, but am sure they are at least 100-150+ years old and antiques. Have not and would not buy any ivory now. But some of the characterizations of priests in that article does make one one to wretch… evil. This is one of my fave dessert! Macapuno instead of fresh buko sounds interesting…will have to try this soon. @Connie C: Shame! can I be BeepBeep (the road runner) now and bury my head in the sand? Yummy, MM! 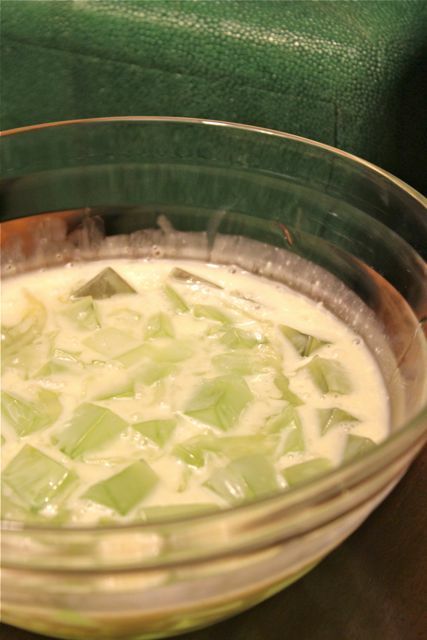 I will try to find screwpine here (I’m sure I’ll be able to) so that I can make this version of buko pandan. Connie C, thank you for providing the link on Blood Ivory, I read it and yes, it IS disturbing. Sarap naman ng macapuno pandan. You’re right, MM. It’s a newer phenom since wala pang buko pandan when I left Pinas in ’88. @Connie C, that article was truly cringe-worthy. :( Thanks for sharing. My favorite pandan….. ssiiggh another craving…. (^-^)	Ty for sharing MM! Connie C ty for sharing the link on Blood Ivory. Yess indeed the dark side of Cebu. Hi, MM – Beautiful pictures as always. I’d like to share my story about a buko pandan I prepared for the Office Int’l Day. Almost everyone liked it except one of the bosses who said,’ it’s nice but it’s too green’. Of course, I have to put a few drops of green pandan flavour to my buko pandan to make it look colorful. Yes, MM, thanks. My sister called me about it this morning. hi MM, I think this dessert was first served at Cafe Adriatico in the 80’s as Claude’s Dream (after Claude Tayag) so you are right that its origins were in the last 20-30 years lang. I agree with you on buco pandan being a new phenomenon. I don’t think I’ve ever tried buco pandan till I was in my 30s (and I’m still in my 30s), or perhaps I exaggerate, maybe I’ve had some pandan flavored food when I was in my 20s (and it was not even rice).